This month we welcome Chris Tyquin, Co-Managing Director, goa, Brisbane, Australia. Please give us your career background and how you got into Out-of-Home. In 1981, I was fortunate to get a traineeship with Australia’s largest and most successful television network and was with it for eight years. Apart from a brief stint wearing the Scooby Doo suit at network-sponsored events (which came to an abrupt end after an unfortunate incident in a Hotel bar), all of my time was in sales in Brisbane and later Sydney. It was a great time for television and I got to work with some of the network’s largest clients. The move into OOH was unplanned. My father’s partner had sold out of goa and, not long after, Dad was diagnosed with a couple of serious health issues. He put it to myself and my brothers that either we come into the business or he would sell it. Over the next couple of years, we all joined the business. You personally also seem to have a very eclectic set of interests, not only as a Director of Australia’s Outdoor Advertising Association, but you have a big interest in sailing (as a former Australian Yachting Champion) as well as in a museum, a festival and more. How do you divide your time and still work on growing your business? I generally look at how I spend my time and how I might learn and benefit with what I’m doing elsewhere in my life and at work. I have been very fortunate with my sailing in that a number of my crew were at some stage involved in the Olympics or Americas Cup. A lot of what I learnt from them and campaigning racing yachts has gone on to be applied in the business. High level sport is about managing people, resources and logistics and working towards a collective outcome in a high performance environment. In principle, it is all very relevant to business. In regards the Museums and Festivals, beyond a personal interest and a moral obligation to serve and contribute something back to our community, these organizations put me in regular contact with some of goa’s key stakeholders in Government. I understand that goa is a family-owned business. Can you tell us the company’s history? And who are the current owners? My family has a long history with OOH. My grandfather began working with Claude Neon in the early 1940s and went on to become its Australian CEO. In 1960, my father bought a then-50-year-old run-down poster business and built on that substantially, sold out completely in the early 80s and semi-retired. Mum couldn’t stand him being at home all the time, so he and his then-partner George Savage started goa in 1983 out of a tin shed not far from where we are currently located. The business is still owned by the family. You have offices in Brisbane, Queensland and Melbourne. Can you please explain your offices and your relationship with Shipley Brown Media Group in Queensland and QMS Asia Pacific in Melbourne? We don’t have offices in Melbourne as such. QMS and Shipley Brown act as goa’s sales agents in Melbourne and Sydney respectively. About 30% of our revenue comes out of these markets. Looking at your six different billboard products, please tell us a little about each and how many screens you have in each type. The business started off doing just roadside billboards and posters (most of it in the early days carrying tobacco advertising). In the years that followed, we expanded into cross track station platforms and, in 2009, we switched on the first large format LED screen in Brisbane. 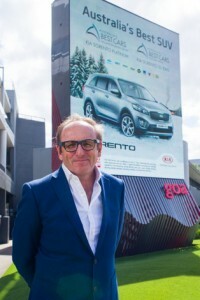 We then went on to develop the largest Digital Billboard Network in Australia. You also have a signage division. What percentage of your overall business is in signage? Until recently it was a very small part of our business but we are now investing and staffing up. I expect it to be 10% of our revenue in 2018. Why was this division started? Our billboard clients asked us to start it as they wanted LED on premise signage and wanted technology they could trust would work. We had acquired all this experience and expertise with LED technology and figured we could put it to use as a revenue stream. We only recommend products we use ourselves. Do your billboards and signage have advertisers in common? Yes and no. About half of our billboard clients buy signage from us. Does one usually spur the other? Yes, the billboard business has been a great source of leads for the signage business unit. What type of measurement do you use for your products? What have you discovered using it that surprised you? Way back, we did pre-audience measurement on several ground-breaking campaigns, one of which involved a fictitious beer as a way of testing the medium and identifying its performance traits. We measured these campaigns through quantitative awareness tracking and noticed early on that OOH seemed to enjoy surprisingly high levels of recall amongst high income earners and top end occupational groups (eg. Doctors, Lawyers, Senior Managers, etc.). This was regardless of the product or service being advertised. Research experts who reviewed the findings said that it would make sense, as this demographic is one that is highly mobile and by their very nature, they are highly aware of what is going on around them. Years later, with the launch of MOVE, we observed a similar trait with a higher than average make up of audiences being from these demographics. With Fusion due to be launched in late September, it will provide an opportunity to dig further into who is engaging with OOH more than others. What would you say are the biggest differences with Australian consumers compared to those in other countries in terms of reception and engagement with DOOH? Australian consumers are spoilt for media choice. We still have free-to-air TV with a great product offering. If I look at OOH, the quality of the structures in regards to industrial design, be it a billboard or a bus shelter, is as good if not better than what I see in say the USA market – and our population and economy is a fraction of the size. In regards to Australian audiences engaging with DOOH, our own experiences have been pleasantly surprising. In quick summary, we are finding that they notice and react quicker than they would to a static billboard campaign. So, in effect, we are seeing DOOH as driving immediacy, which for many years has been the domain of Television. Have you incorporated the use of mobile in any way with your billboards? Can you give us an example? If you are asking about mobile digital billboards then the answer is no but we are working on it . The obstacle is industrial design. We won’t just go and put a screen on the back of a truck. I want it to look like it just landed from outer space. Lots of Wow factor! We’ve spent tens of thousands of dollars on design concepts but the technology just isn’t quite where we need it to be to do it the way we would like. On the other hand, ‘goa connect’ was launched a couple of years ago to allow the public to engage with clients campaigns on both the GRID and ICONICS. They can do this via any smart device anywhere in the world so if they want to post pics of themselves holidaying in NYC live to goa’s screen networks, they can. Whose Content Management Software do you use and why? Scala. We went to market a bit over four years ago and at the time there wasn’t much to choose from. Having said that, Scala has been a good reliable product and upgrades have been generally delivered in the time frames they indicate (which is unusual for software suppliers). What is the most interesting campaign that ran on your billboards in the first six months of 2016? Sadly, nothing jumps out in the last six months. But my all time favourite is a campaign we ran during the G20 Summit when it was in Brisbane 18 months or so ago: These three 20-something kids arrived at reception one day with an idea to run a message from God during the G20 on our GRID network. (It was then 20 large format screens around Brisbane with an audience potential of over 250,000 people a day.) When we asked how they might be paying for such a campaign they confidently told us it wouldn’t be a problem, and “We’ll be crowd-sourcing the money.” They raised over $30,000 in three days! Titled Outrageous Love, it was an outrageous success that taught us a lot about the power and performance characteristics of large format digital billboards and how our audience will genuinely engage with the medium via social media platforms. We made a short video that’s on our web site. It’s worth a look. Advertisers and agencies are offered the opportunity on your website to try their artwork on your various products and locations. How often is it used? Who uses it most? ‘Not enough’ is the short answer! The poor quality of OOH creative has been a frustration of mine since coming into the industry 20-plus years ago. OOH is a medium with no editorial content. The success of the ad is solely reliant on the strength of the creative. I know there are a lot of conversations about digital revenues cannibalizing static revenue. My own opinion is this is because we and the Creative people within agencies have failed entirely to capitalize on what Digital offers. If we continue to allow agencies to schedule the same copy on digital as Static then I expect the cannibalization to continue. We have begun working on addressing the issue ourselves by appointing Mojo Brisbane, the former Creative Director of Publicis, as our Head of Creative, and with digital, we are now actively encouraging clients to run with the likes of a storyboard approach where copy changes daily as a way for our clients to capture and hold the audience’s attention for the duration of a campaign. Staging this approach on static, with daily copy changes, has always been prohibitively expensive, but on digital, it’s really no extra cost. I’m amazed we haven’t seen more of it sooner. Also on your website, you lay out some specifics for recruiting landowners for placement of your billboards. How is that working? The web site is just part of what we do. Most of our landlord activity for new sites is target- or location-specific and involves direct contact. We generally find we will look at over 50 potential new billboard locations before picking one that fits a pretty rigorous criteria of assessment. We have to be fairly fussy now, as the likes of our ICONICS are costing up to $2 million to design and build. What is your growth strategy? Do you expect your best opportunity is by new products? Mergers and acquisitions? Simple organic growth with existing products? And are you looking for investment to help you grow? We work about three years ahead. Although having said that, we have recently completed two deals that we had been working on for over eight years! At the moment, we have enough on our plate with organic growth and capital requirements funded from within to enable revenue growth to run between 20% and 30% a year for the next years. We tend to look at every opportunity as it arises and apply a due diligence around deployment of capital, returns (both short and long term) and the risks around those returns. On a similar note, do you have any plans for expansion beyond Australia’s borders? Where and why – or why not? Expansion yes, but not in a traditional sense. At a global level, business across many industries in Australia is extremely challenging and competitive and that is now being recognized externally, particularly in China. We now have Chinese companies looking to buy or align with well-run businesses in Australia on the basis that, if it can make good money here with a small market of around 23 million people, they figure that expertise and offering into Mainland China will make infinitely more money. We have had initial approaches by OOH operators from both Asia and the Middle East about providing our systems and expertise into their respective markets. You are a former chairman and currently a Director of the Outdoor Media Association. What is that organization’s most pressing concern right now? Fusion, which will in effect be MOVE Version 2, is due to be released in late September. Also in the pipeline, the OMA has been working on what will eventually be its own ATP (Automatic Transaction Platform). The industry body in Australia is remarkably coherent and progressive. MOVE is deservedly recognized as the Global Gold standard in OOH Audience Measurement and considering our size on the world stage, we should be very proud as an industry. In regards to the ATP, the Board has had the wisdom to foresee that it’s far better for us to own the platform than be forced to trade on someone else’s. Beyond that, the OMA is heavily focused on getting local and provincial Governments outside of Queensland to give the go ahead to large format Digital. Where do you foresee the Australian DOOH industry by the year 2020? I don’t know! And that’s what makes it so exciting. I say that because we now doing things like goa connect today that weren’t even on our radar two years ago, so God knows where we will be in 2020. All I know is that Steve Jobs’ great quote keeps resonating in my head – “Innovation distinguishes between a Leader and a Follower” – and if you aren’t innovating your business to stay ahead then you are effectively putting your destiny into someone else’s hands. This entry was posted on Monday, November 28th, 2016 at 00:01 @042 and is filed under CEO SPOTLIGHT. You can follow any responses to this entry through the RSS 2.0 feed. You can leave a response, or trackback from your own site.